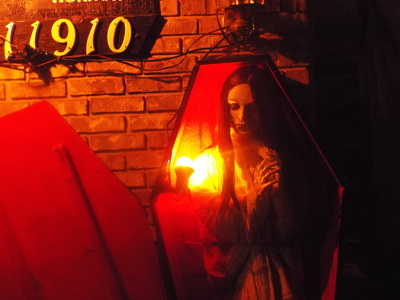 One of the things we look for in all of the haunts we visit is creativity. 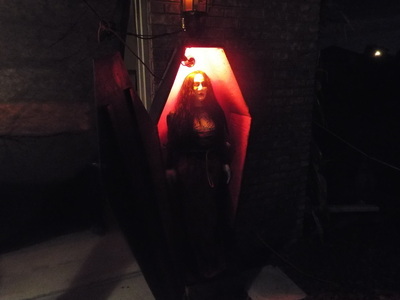 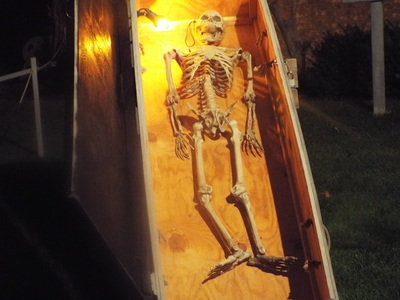 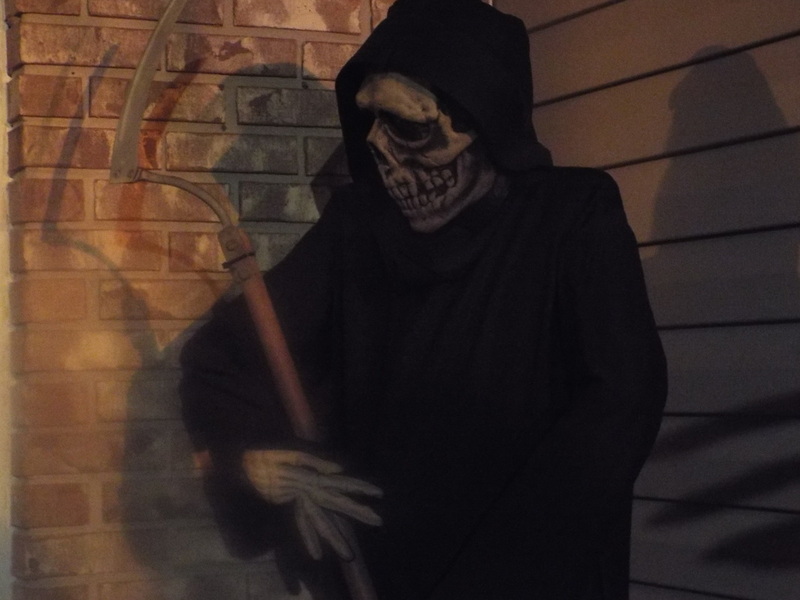 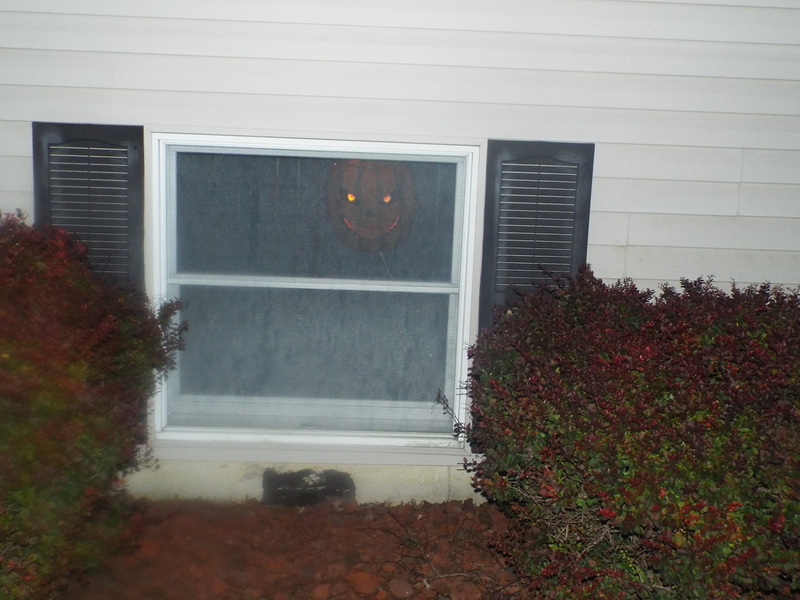 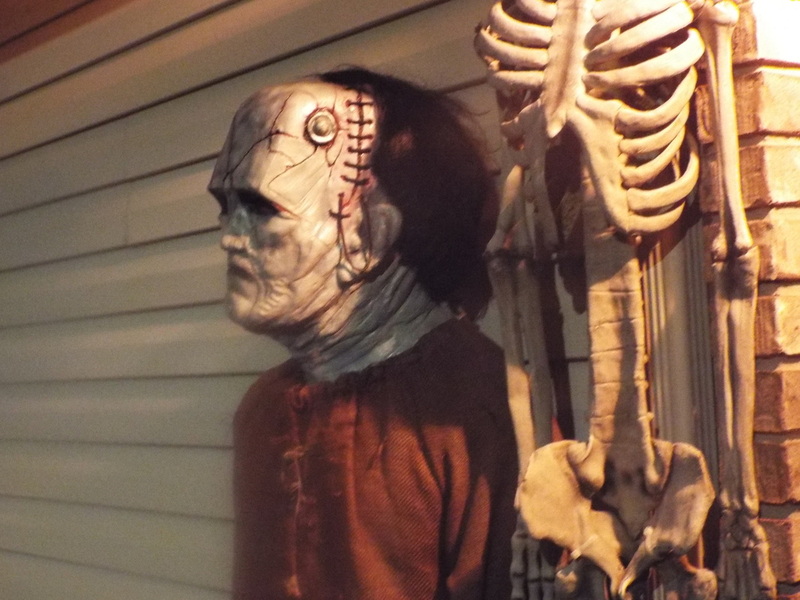 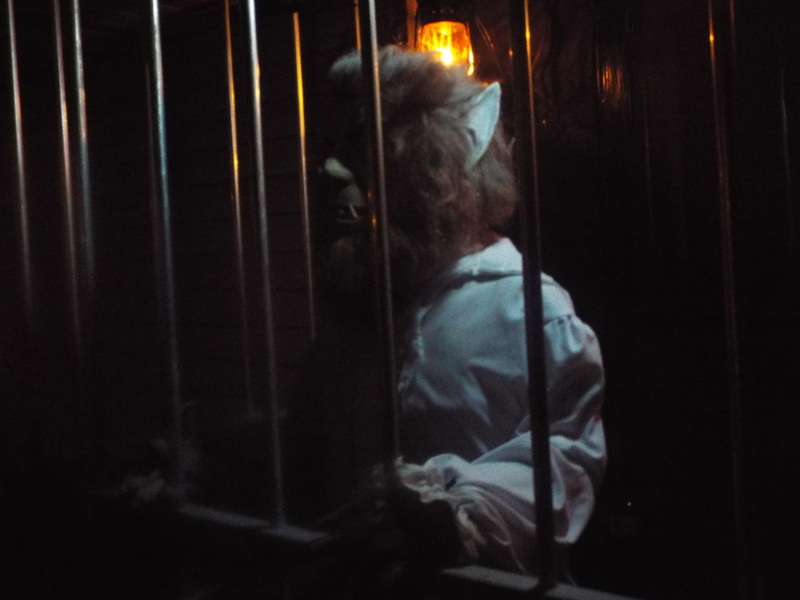 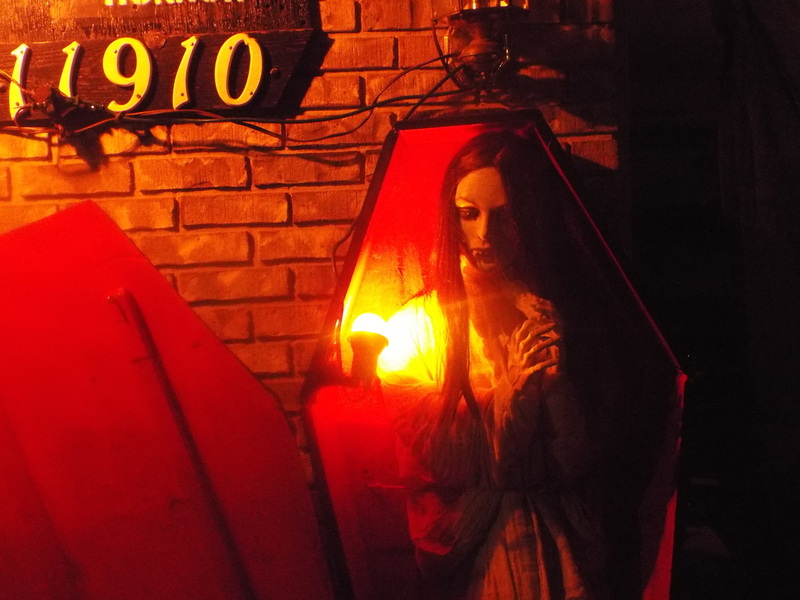 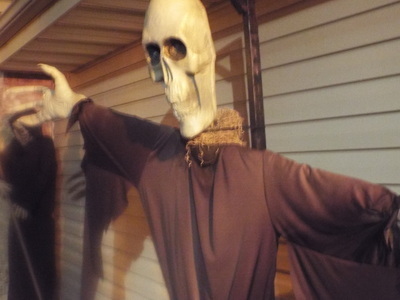 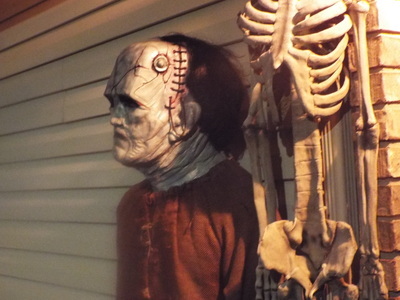 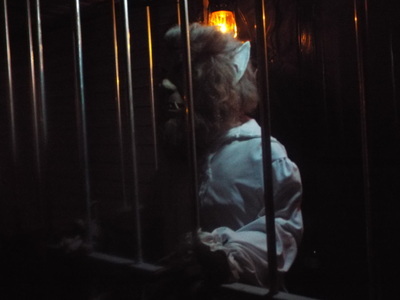 As we know, not all haunts are created equal, and some have more money, more actors, more space, and more whatever than others, so what can really make a haunt stand out is when they do something unusual or creative with what they have. 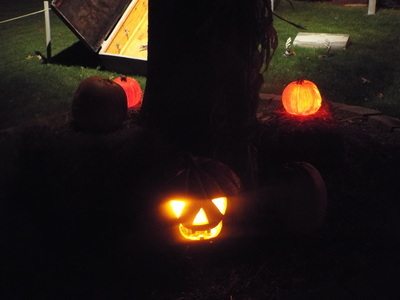 Little things can make the difference between a big, boring haunt and a smaller, more interesting one. Such is the case with the House of Hammer Horror, a haunt that has been running in various forms since 1983. 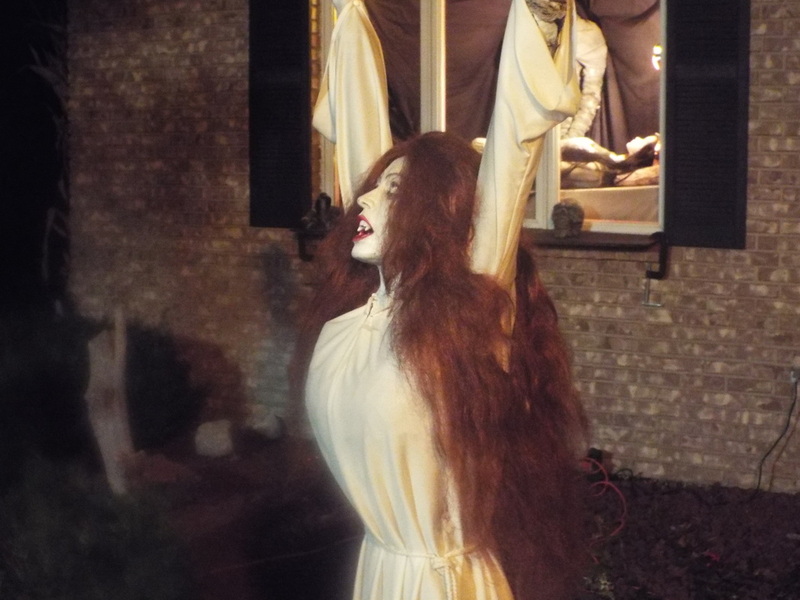 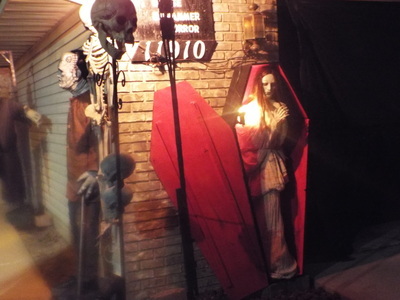 It recently relocated from its former home in Chicago to St. John, Indiana, but it has kept the unique theme that it has that separate it from other displays. 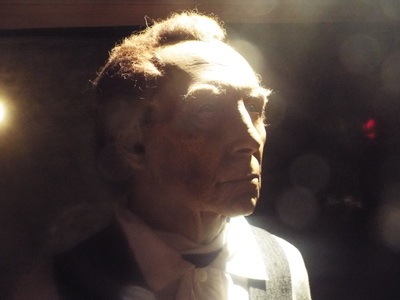 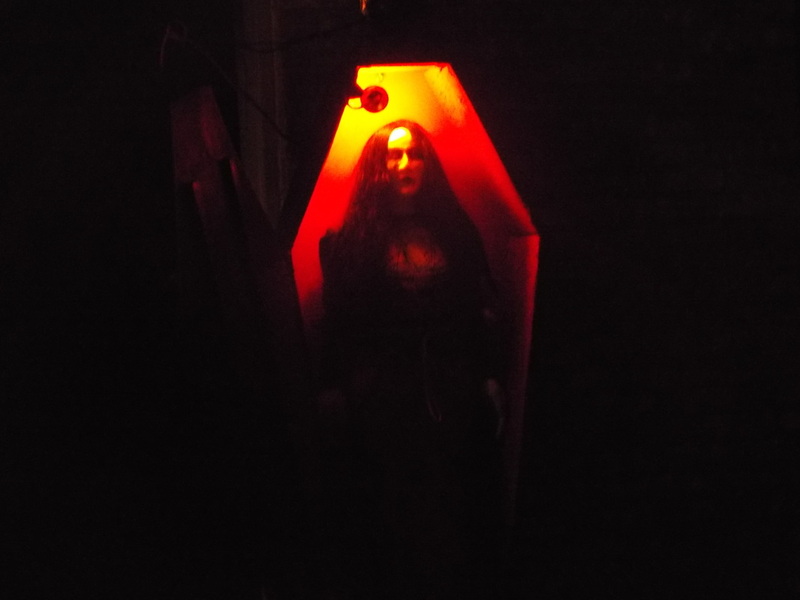 While it might not be the most sophisticated of displays (it has no pneumatics or huge individual scenes, for example), it does have one thing that we have yet to see in any form at any other haunt we've visited, and that is the them of Hammer Horror movies. 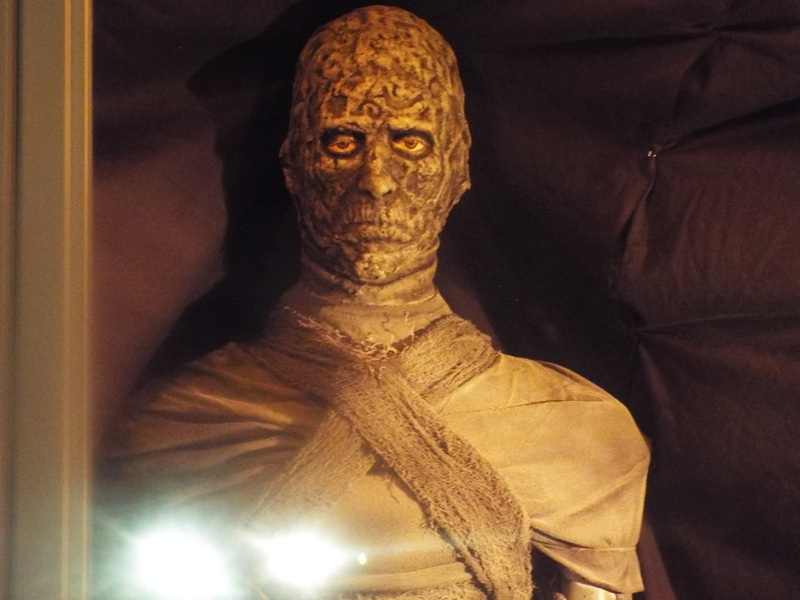 From the 50's through the 70's, Hammer Horror films helped redefine the classic horror genre initiated by the Universal monster movies of the 1930's and 1940's. 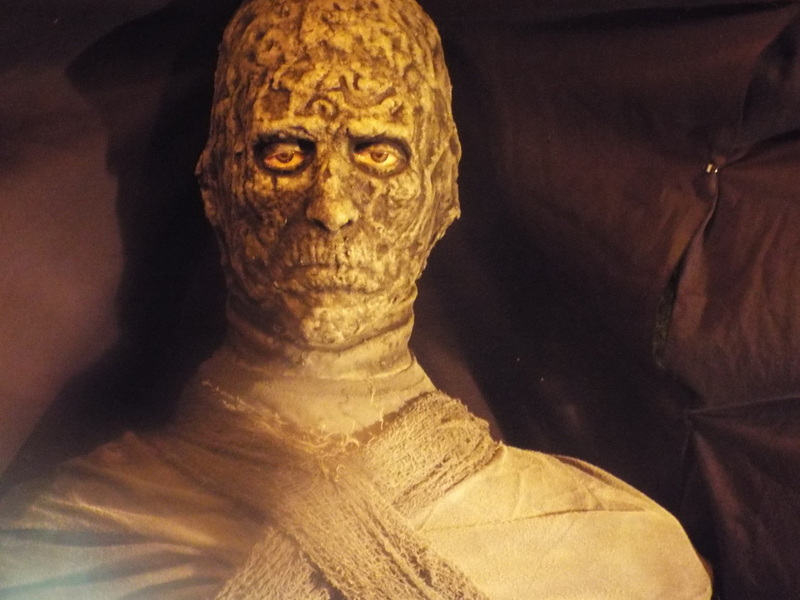 By upping both the gore and the sexuality, and by presenting films in glorious color, Hammer created memorable versions of classic horror monsters like Frankenstein's monster, Dracula, the Mummy and more. 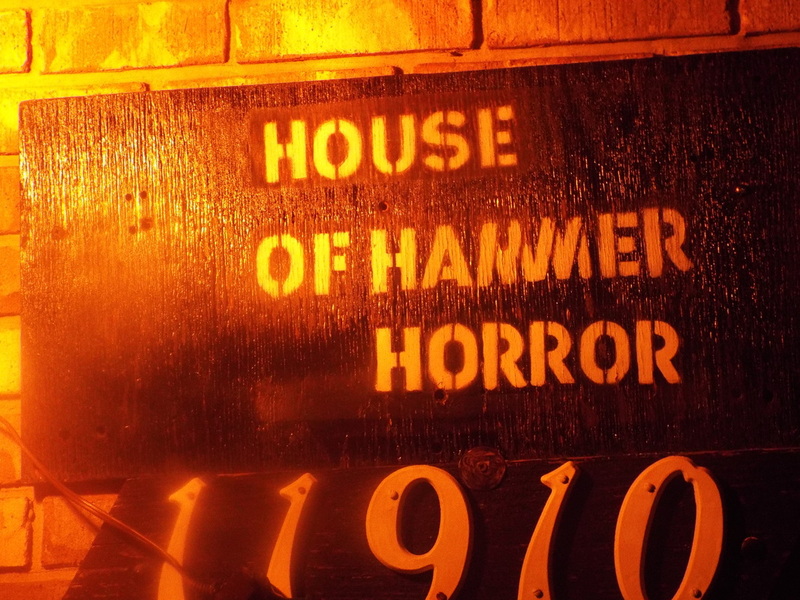 House of Hammer Horror pays tribute to all of them. 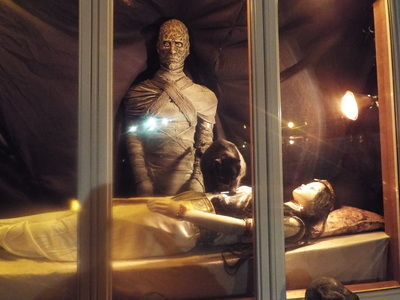 Scenes form many Hammer movies are on display here, including the female vampires from Brides of Dracula, an Ingrid Pitt figure from the Vampire Lovers, A full-sized Oliver Reed as the werewolf from Curse of the Werewolf, Peter Cushing as Dr. Frankenstein and Christopher Lee as the monster from the Curse of Frankenstein, and Kiwi Kingston as the monster from The Evil of Frankenstein. 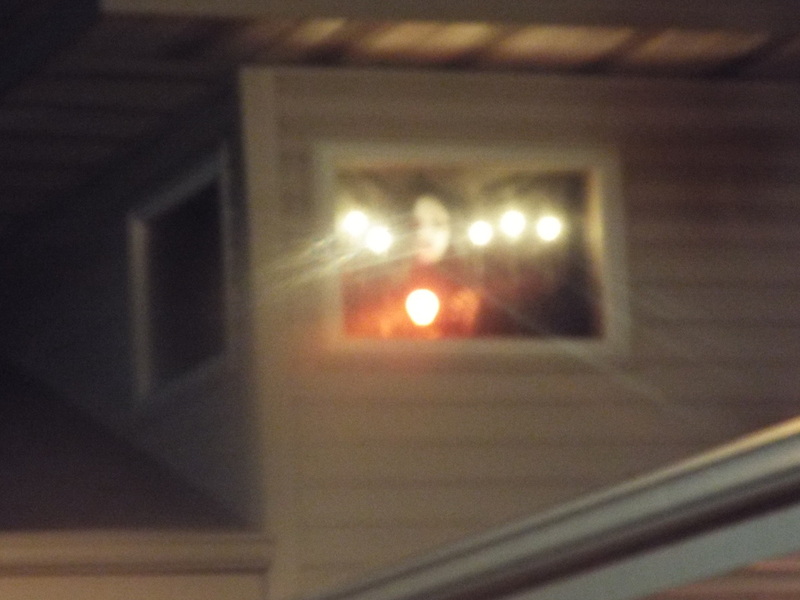 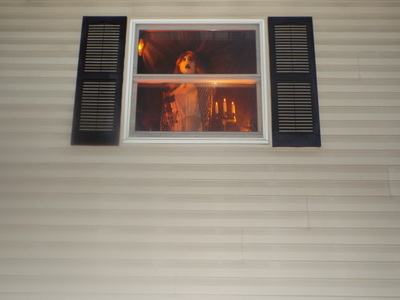 There is even a nod to modern Hammer Films, as the Woman in Black stares down at visitors from an upper window. 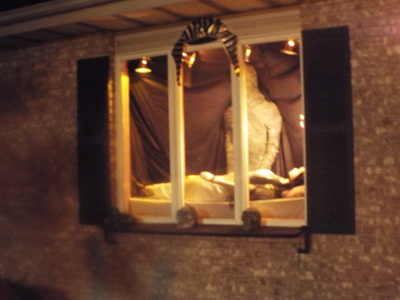 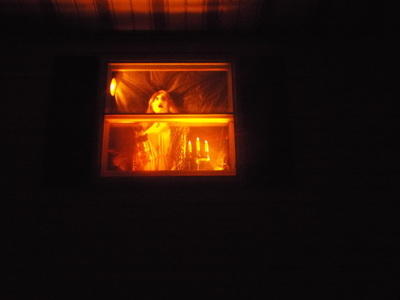 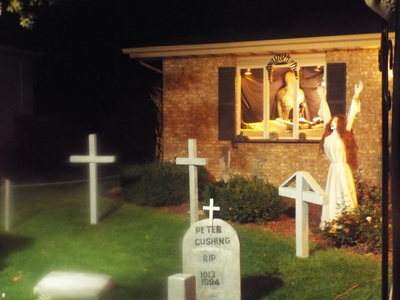 The centerpiece of the entire display is the main window of the house, which features a different scene each year. 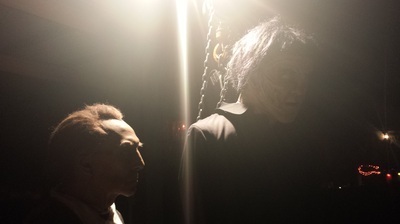 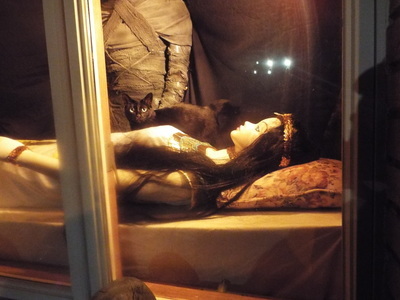 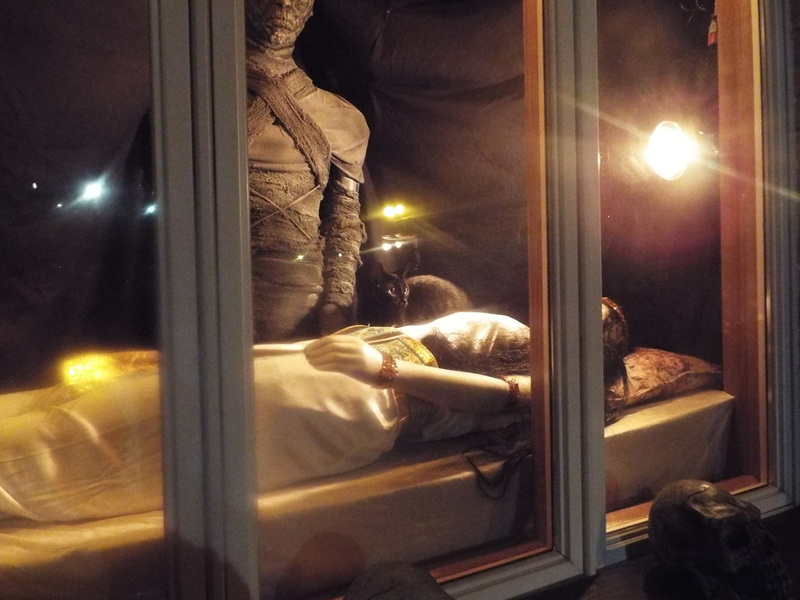 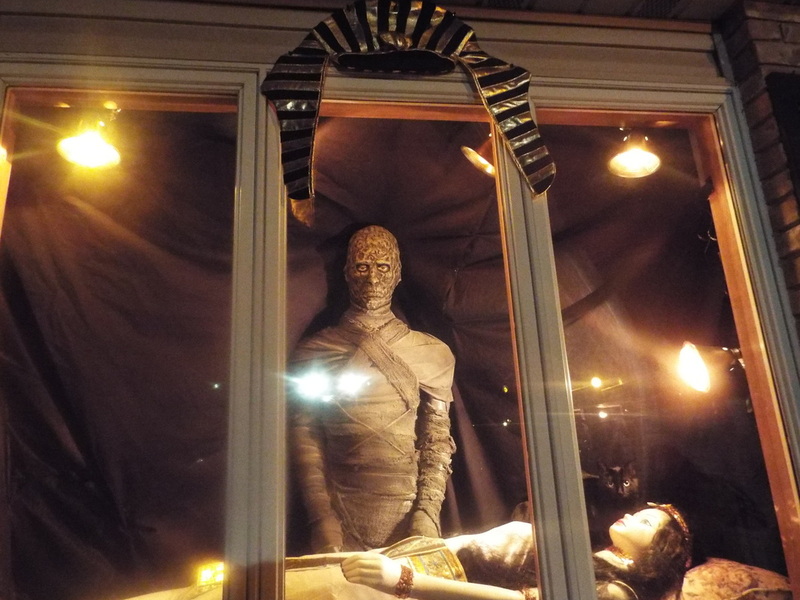 This year featured Christopher Lee as the Mummy, towering over his love Princess Ananka. 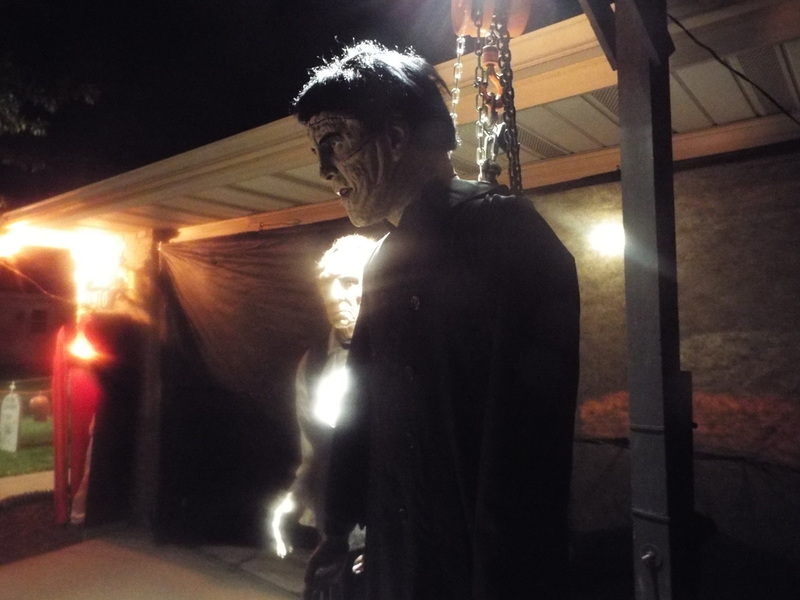 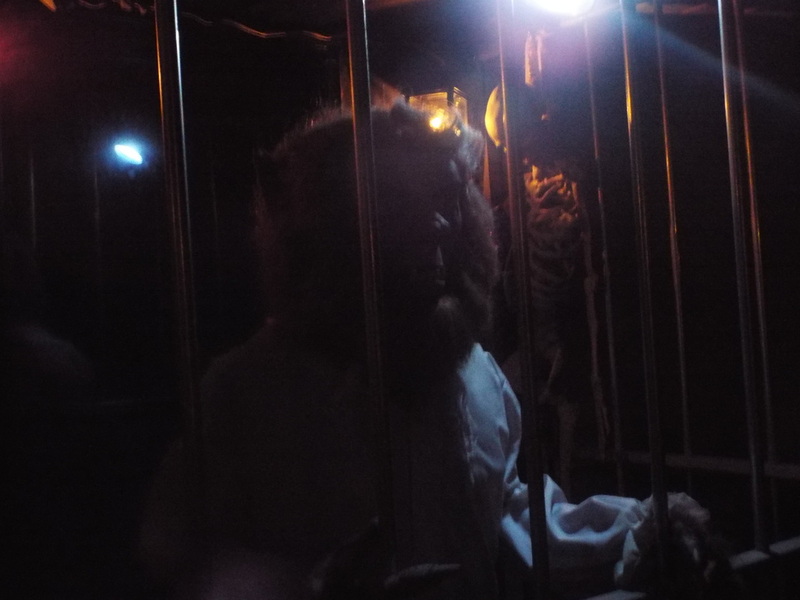 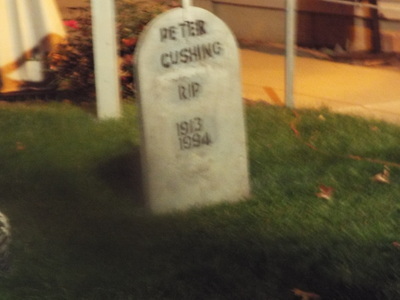 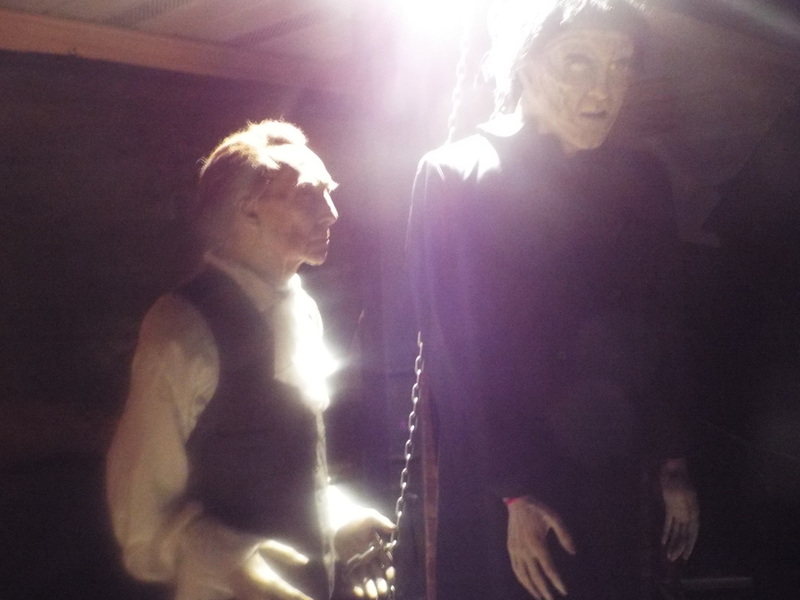 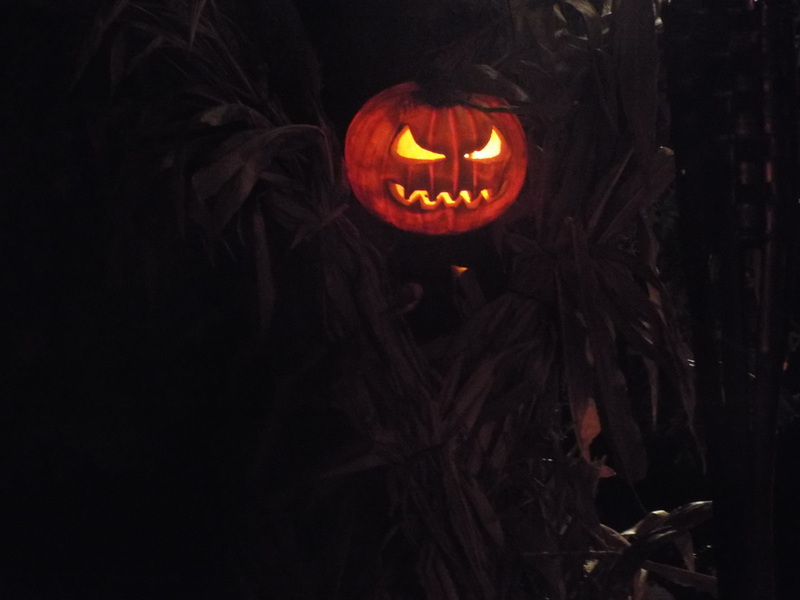 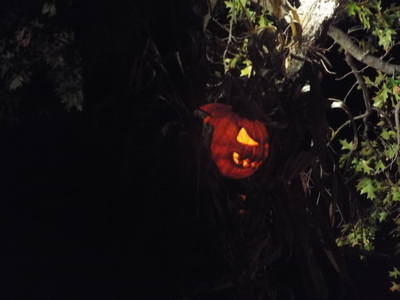 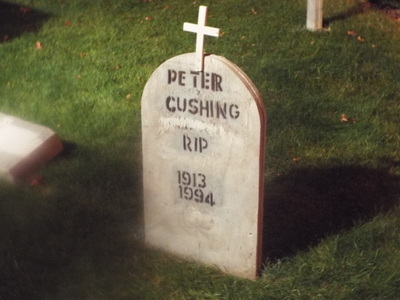 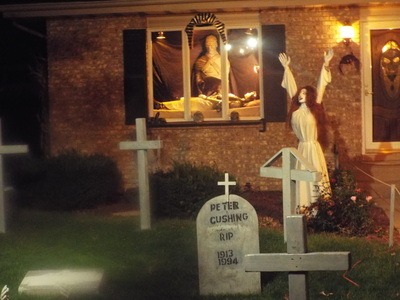 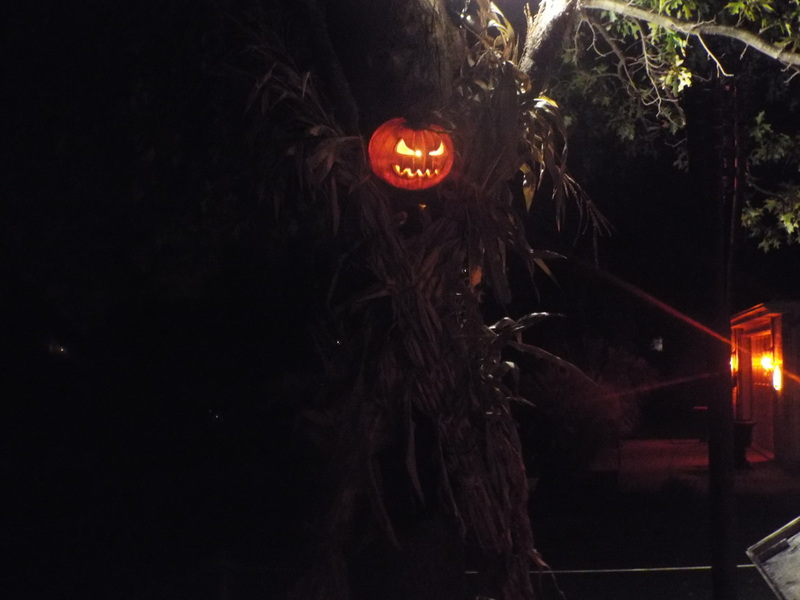 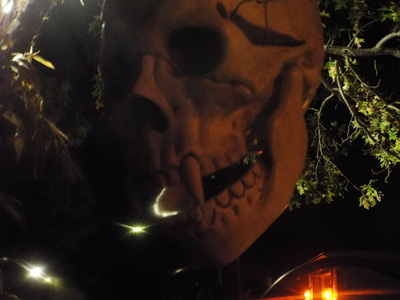 The display is rounded out by a graveyard with various tombstones, including one for Peter Cushing, pumpkins, skeletons, and a really creepy Jack-o-lantern creature hanging from a tree. 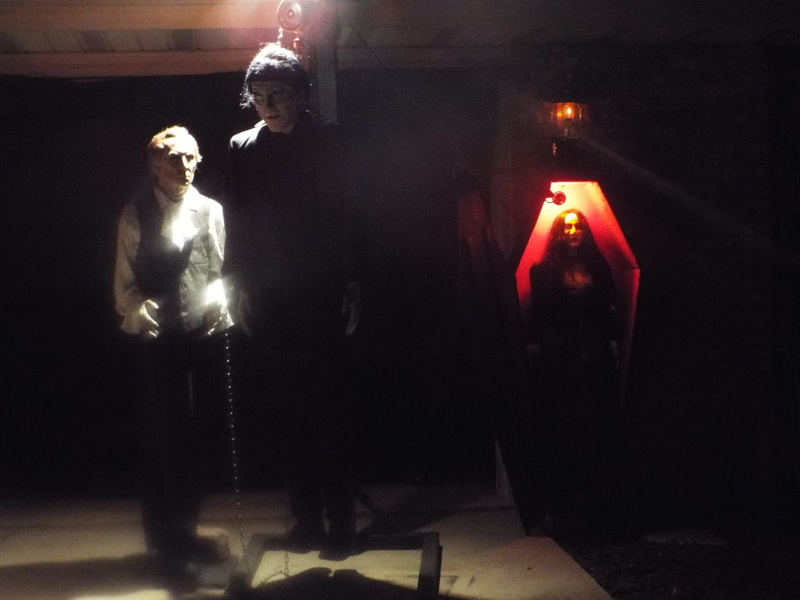 It's a great display, and one that all fans of Hammer Horror should check out. It might not be the biggest or the best, but it's got a unique theme that's worth seeing.